Anthony Petrie is a New York City based artist who works in multiple mediums. His pop art style has attracted clients like Marvel, Paramount, Sony, Bad Robot, Hasbro, Nicelodeon and the Cartoon Network to name a few. He creates striking images that are far more than a riposte of their subject. His work shows reverence and admiration that resonates deeply with a pop culture obsessed geek like me. When I was a kid I had these Super Mario Bros. scratch-off trading cards. One day for whatever reason, I decided I wanted to draw them while I was watching cartoons. I haven’t stopped since. Some of your work reminds me of Roy Lichtenstein or the pop-art music posters that have had a resurgence in recent years. What if any specific artists continue to inspire your work? I don’t think I’ve ever been compared to Roy Lichtenstein’s, but I’ll take it. I think just being immersed in the pop art scene, and seeing contemporary artist’s work is inspiring. When you see fellow artists in the same circle progress and try new techniques it drives you to do better yourself. Some of my all-time favorite artists are Robert McGinnis, JC Leyendecker, Mike Mignola, Chris Cooper, Sergio Toppi, and the list goes on and on forever. The Sharknado prints you did were great. I loved the play on the coppertone ad. What gave you the idea of combining those two elements? It was a product of a last-minute brainstorm between the folks at Gallery 1988 and I. The idea was just the right balance of campy-ness and sophistication for Sharknado, tied together by an element that resonated with a lot of people. Those two posters were drawn and magically printed 3 days before San Diego Comic Con last year, where they premiered. I got a text from G1988 at 9pm on the Saturday before Comic Con while I was in the movie theater watching Pacific Rim. They said they needed 2 posters for Sharknado designed and printed before I left for San Diego on Wednesday, which gave me roughly 3 days to get everything done, including printing and shipping. While I was at the movie I started sketching ideas on a napkin, and then stayed awake for the next 24 straight hours drawing those two posters in order to get the separation files to the printer with enough time to print and ship them for the first day of Comic Con. In the end it was really great to have my work be a part of SDCC. As silly as Sharknado was, it had quite a presence that year, and we did a signing with the producer, director, and one of the actors of the movie. Do you listen to music while you paint? If so what? For some reason I imagine you listening to Goblin while you did the Shaun of the Dead print. If I’m working on a poster for a movie, I’ll have the movie on in the background while I work, or movies in that genre. If I’m working on a gig poster, I’ll have the band’s music on. For the most part though, when I’m working, I’ll have a movie on. If I’m on a really tight deadline and I need to stay up and work fast, it’s Deftones or Rise Against. If I’m just sketching, or have some time on a project, it’s Marvin Gaye, Oldies and Country. I don’t have cable, so music is always on in my apartment. I listen to everything. I have Bob Dylan, Michael Jackson, Awesome Mix Vol. 1 from Guardians of the Galaxy, Bruce Springsteen, Zac Brown Band, Deftones, Alice in Chains, and the Country music station on full rotation right now. I don’t know Goblin, but I’ll check them out. On your blog you mention that you have an unhealthy obsession with zombies. What is the most underrated zombie film? I’ll be honest and say that while I love the idea of zombies, I am also not a zombie purist. I really love when movies take the concept of “zombie” and do something different or original with it. The slow-walking, crawling-up-from-the-grave, deteriorating zombies from the old George A. Romero movies are awesome, but they aren’t my favorite. There’s something about fast moving and adaptable zombies that just terrifies me. I might lose some credibility for this, but I really love Zach Snyder’s Dawn of the Dead remake. 28 Days Later and 28 Weeks Later are probably my favorite zombie movies, as I think they really revolutionized this idea that zombies can be created via an “infection” and be fast moving. I think it’s the added realism that really drives that terror home for me. 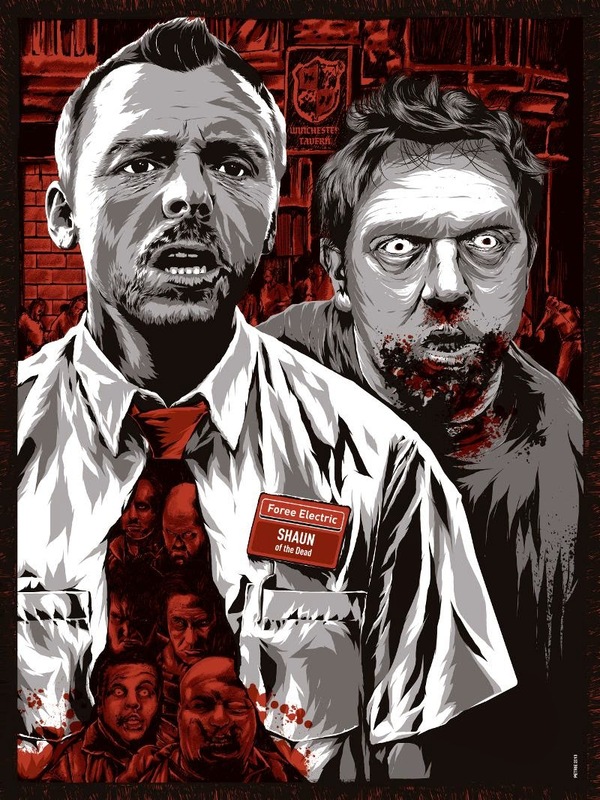 And speaking of slow-moving zombies, Shaun of the Dead is one of my all-time favorite films, not just in the zombie genre. To answer your question though about ‘underrated’ zombie movies: I don’t think anyone ever thinks of Rob Rodriguez’s Planet Terror as a zombie film, but it totally is, and it’s amazing. Fido is a retro-inspired zombie movie that has a Shaun of the Dead kind of humor vibe to it. It’s a movie about a boy and his dog. But instead of a dog, it’s a zombie. Incredible. For all intents and purposes, Return of the Living Dead is simultaneously awful and awesome, but regardless, it has one of the most iconic zombies in it: Tar-Man. And lets of course not forget Michael Jackson’s Thriller, which really got me started on all things horror and zombie related. The Propaganda style used for the Rock IV print is pitch perfect considering it is one the most jingoistic films I've ever seen. Despite my lefty leanings I unabashedly love that silly movie. With that being said you chose a moment when Rocky is being punched for the piece. Is that in anyway a commentary on the film itself or the United States? Ha. There was no intentional political commentary on that poster, but if that is how you choose to interpret the image, I’m totally cool with that! I think as long as people have some sort of emotional reaction to my art, good or bad, I’ll consider it successful. That particular poster was for a show at Gallery 1988 called “Say Hi to the Bad Guy,” about cult movie villains. To me, the bad guys are always more interesting, so I thought creating art that “celebrates” them was a great concept. Even though the poster is in the style of constructivist propaganda, I do think it has a very “Rocky IV” sentiment to it. 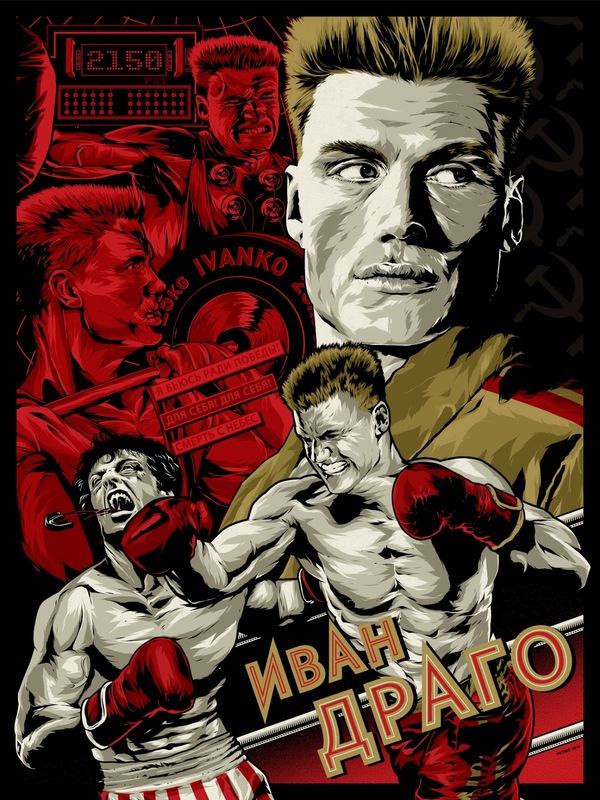 Most of the movie is Apollo and Rocky getting their asses kicked by Drago, who seemed super-human, so making a poster that portrays Drago as larger than life made a lot of sense. 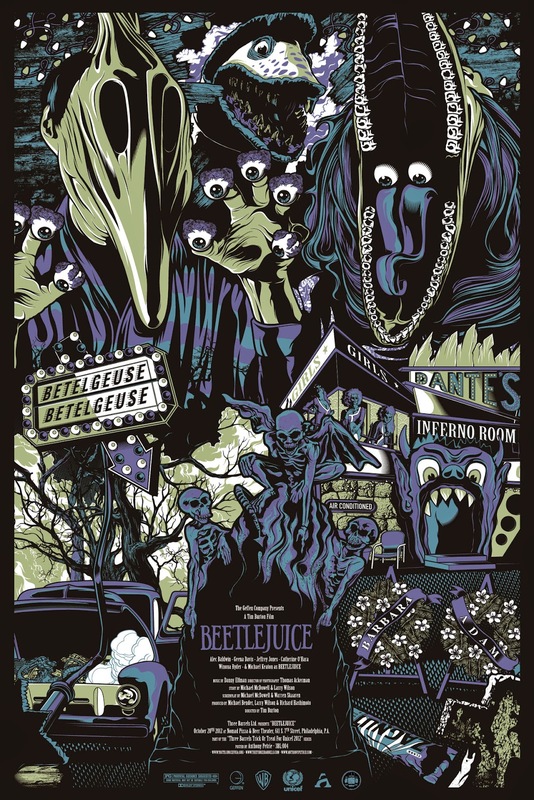 The Beetlejuice or Betlegeuse print is one of my favorites of your film posters. The way you captured the essence of the film without showing any of the main characters is a testament to your ability as an artist. How do you chose a character or a moment to focus on for your posters? Thanks. For the Beetlejuice poster, I knew from the start that I didn’t want to do something obvious. There are so many other iconic elements from that movie, I thought a bolder statement would be to leave the title character off altogether. I went back and forth on this a lot, especially considering this was only my second officially licensed poster, and I worried this would deter fans. The movie is named Beetlejuice, but I really felt that the story was about Barbara and Adam Maitland, so I wanted to showcase an iconic moment about them. In the end, I did feel like something was missing, so I ended up doing a transparent glow-in-the-dark layer of Beetlejuice which I think really tied the concept together. I try to choose content that best conveys the overall themes or mood of a movie. Sometimes that means the main character, sometimes that means the supporting characters, and often times that means no characters at all. My favorite posters are the ones that “feel” like the movie, but don’t have the characters plastered all over the page. The ones that you have to spend some time in front of that make you think a little bit. Usually this means stripping down all of the most obvious elements, and focusing on more iconic details. How much freedom are you given when you are commissioned for a piece? For the most part I’ll have total creative freedom. For some commercial work, licensed work, and “official” projects, there are some caveats that may include: not using likenesses, needing to use specific photo references, or a brief with general art direction. For pretty much everything else, such as gallery work, I’m free to direct my own pieces. If a project comes up that I feel will be too heavily art directed by someone else, I will decline it. It’s tough to do that sometimes, especially if it’s a good opportunity, but I’m fortunate to be at a point in my career where I’m finally able to say “no” if I need to. Anthony Petrie can be found all over the internet and prints of his work are for sale through his website. Follow him on Twitter and Instagram or stop by his website and purchase a print. It would make a great gift for that movie geek in your life.